Schematic diagram showing the physical processes inside the Earth that lead to the generation of magma. Partial melting begins above the fusion point. The origins of the concept of hotspots lie in the work of J. Tuzo Wilson, who postulated in 1963 that the formation of the Hawaiian Islands resulted from the slow movement of a tectonic plate across a hot region beneath the surface. It was later postulated that hotspots are fed by narrow streams of hot mantle rising from the Earth's core–mantle boundary in a structure called a mantle plume. Whether or not such mantle plumes exist is the subject of a major controversy in Earth science. Estimates for the number of hotspots postulated to be fed by mantle plumes have ranged from about 20 to several thousands, over the years, with most geologists considering a few tens to exist. Hawaii, Réunion, Yellowstone, Galápagos, and Iceland are some of the most active volcanic regions to which the hypothesis is applied. 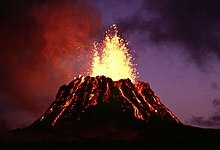 Most hotspot volcanoes are basaltic (e.g., Hawaii, Tahiti). As a result, they are less explosive than subduction zone volcanoes, in which water is trapped under the overriding plate. Where hotspots occur in continental regions, basaltic magma rises through the continental crust, which melts to form rhyolites. These rhyolites can form violent eruptions. For example, the Yellowstone Caldera was formed by some of the most powerful volcanic explosions in geologic history. However, when the rhyolite is completely erupted, it may be followed by eruptions of basaltic magma rising through the same lithospheric fissures (cracks in the lithosphere). An example of this activity is the Ilgachuz Range in British Columbia, which was created by an early complex series of trachyte and rhyolite eruptions, and late extrusion of a sequence of basaltic lava flows. The hotspot hypothesis is now closely linked to the mantle plume hypothesis. Hotspot volcanoes are considered to have a fundamentally different origin from island arc volcanoes. The latter form over subduction zones, at converging plate boundaries. When one oceanic plate meets another, the denser plate is forced downward into a deep ocean trench. This plate, as it is subducted, releases water into the base of the over-riding plate, and this water mixes with the rock, thus changing its composition causing some rock to melt and rise. It is this that fuels a chain of volcanoes, such as the Aleutian Islands, near Alaska. Axial Seamount is the youngest seamount of the Cobb–Eickelberg Seamount chain. Its last eruption was on 6 April 2011. 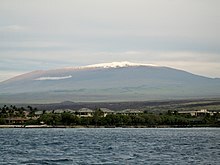 Mauna Kea is the tallest volcano in the Hawaiian–Emperor seamount chain. It is dormant and it has cinder cones growing on the volcano. Hualalai is a massive shield volcano in the Hawaiian–Emperor seamount chain. Its last eruption was in 1801. The joint mantle plume/hotspot hypothesis envisages the feeder structures to be fixed relative to one another, with the continents and seafloor drifting overhead. The hypothesis thus predicts that time-progressive chains of volcanoes are developed on the surface. Examples are Yellowstone, which lies at the end of a chain of extinct calderas, which become progressively older to the west. Another example is the Hawaiian archipelago, where islands become progressively older and more deeply eroded to the northwest. 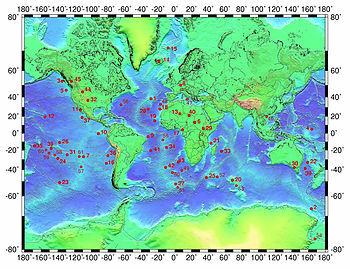 An example of mantle plume locations suggested by one recent group. Figure from Foulger (2010). Distribution of hotspots in the list to the left, with the numbers corresponding to those in the list. The Afar hotspot (29) is misplaced. Possibly related to the North Atlantic continental rifting (62 Ma), Greenland. Possibly related to the Afar Triple Junction, 30 Ma. Gough hotspot (49), at 40°19' S 9°56' W.
Tristan hotspot (42), at 37°07′ S 12°17′ W.
Vema hotspot (Vema Seamount, 43), at 31°38' S 8°20' E.
Related maybe to the Paraná and Etendeka traps (c. 132 Ma) through the Walvis Ridge. Possibly related to the Columbia River Basalt Group (17–14 Ma). Possibly related to the Caribbean large igneous province (main events: 95–88 Ma). Possibly related to the Ontong Java Plateau (125–120 Ma). ^ a b W. J. Morgan (5 March 1971). "Convection Plumes in the Lower Mantle". Nature. 230 (5288): 42–43. Bibcode:1971Natur.230...42M. doi:10.1038/230042a0. ^ "Do plumes exist?". Retrieved 25 April 2010. ^ a b c Foulger, G.R. (2010). Plates vs. Plumes: A Geological Controversy. Wiley-Blackwell. ISBN 978-1-4051-6148-0. ^ Wilson, J. Tuzo (1963). "A possible origin of the Hawaiian Islands" (PDF). Canadian Journal of Physics. 41 (6): 863–870. Bibcode:1963CaJPh..41..863W. doi:10.1139/p63-094. ^ "Hotspots: Mantle thermal plumes". United States Geological Survey. 5 May 1999. Retrieved 15 May 2008. ^ Wright, Laura (November 2000). "Earth's interior: Raising hot spots". Geotimes. American Geological Institute. Retrieved 15 June 2008. ^ Donald Hyndman; David Hyndman (1 January 2016). Natural Hazards and Disasters. Cengage Learning. pp. 44–. ISBN 978-1-305-88818-0. ^ Wolfgang Frisch; Martin Meschede; Ronald C. Blakey (2 November 2010). Plate Tectonics: Continental Drift and Mountain Building. Springer Science & Business Media. pp. 87–. ISBN 978-3-540-76504-2. ^ Holbek, Peter (November 1983). "Report on Preliminary Geology and Geochemistry of the Ilga Claim Group" (PDF). Retrieved 15 June 2008. ^ Mainak Choudhuri; Michal Nemčok (22 August 2016). Mantle Plumes and Their Effects. Springer. pp. 18–. ISBN 978-3-319-44239-6. ^ "Axial Seamount". PMEL Earth-Ocean Interactions Program. NOAA. Retrieved 23 September 2014. ^ "What the hell is Hawaii?". Retrieved 7 January 2011. ^ Courtillot, V.; Davaillie, A.; Besse, J.; Stock, J. (2003). "Three distinct types of hotspots in the Earth's mantle". Earth Planet. Sci. Lett. 205 (3–4): 295–308. Bibcode:2003E&PSL.205..295C. CiteSeerX 10.1.1.693.6042. doi:10.1016/S0012-821X(02)01048-8. ^ E. V. Verzhbitsky (2003). "Geothermal regime and genesis of the Ninety-East and Chagos-Laccadive ridges". Journal of Geodynamics. 35 (3): 289. Bibcode:2003JGeo...35..289V. doi:10.1016/S0264-3707(02)00068-6. ^ a b c d e f g h i j k l m n o p q r s t u v w x y z aa ab ac ad ae af ag ah ai aj ak al am an ao ap aq ar as at au av aw ax ay az ba bb bc bd be bf bg bh bi W. J. Morgan and J. P. Morgan. "Plate velocities in hotspot reference frame: electronic supplement" (PDF). Retrieved 6 November 2011. ^ Nielsen, Søren B.; Stephenson, Randell; Thomsen, Erik (13 December 2007). "Letter:Dynamics of Mid-Palaeocene North Atlantic rifting linked with European intra-plate deformations". Nature. 450 (7172): 1071–1074. Bibcode:2007Natur.450.1071N. doi:10.1038/nature06379. PMID 18075591. ^ O'Neill, C.; Müller, R. D.; Steinberger, B. (2003). "Revised Indian plate rotations based on the motion of Indian Ocean hotspots" (PDF). Earth and Planetary Science Letters. 215 (1–2): 151–168. Bibcode:2003E&PSL.215..151O. CiteSeerX 10.1.1.716.4910. doi:10.1016/S0012-821X(03)00368-6. Archived from the original (PDF) on 26 July 2011. ^ O'Connor, J. M.; le Roex, A. P. (1992). "South Atlantic hot spot-plume systems. 1: Distribution of volcanism in time and space". Earth and Planetary Science Letters. 113 (3): 343–364. Bibcode:1992E&PSL.113..343O. doi:10.1016/0012-821X(92)90138-L.
^ Smith, Robert B.; Jordan, Michael; Steinberger, Bernhard; Puskas, Christine M.; Farrell, Jamie; Waite, Gregory P.; Husen, Stephan; Chang, Wu-Lung; O'Connell, Richard (20 November 2009). "Geodynamics of the Yellowstone hotspot and mantle plume: Seismic and GPS imaging, kinematics and mantle flow" (PDF). Journal of Volcanology and Geothermal Research. 188 (1–3): 26–56. Bibcode:2009JVGR..188...26S. doi:10.1016/j.jvolgeores.2009.08.020. ^ "Catalogue of Canadian volcanoes- Anahim volcanic belt". Natural Resources Canada. Geological Survey of Canada. Archived from the original on 16 July 2011. Retrieved 14 June 2008. "Plates vs. Plumes: A Geological Controversy". Wiley-Blackwell. October 2010. Boschi, L.; Becker, T.W. ; Steinberger, B. (2007). "Mantle plumes: Dynamic models and seismic images" (PDF). Geochemistry Geophysics Geosystems. 8 (Q10006): Q10006. Bibcode:2007GGG.....810006B. doi:10.1029/2007GC001733. ISSN 1525-2027. Clouard, Valérie; Gerbault, Muriel (2007). 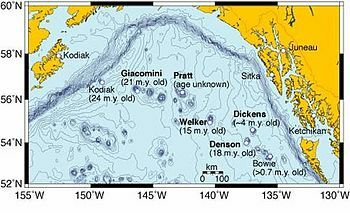 "Break-up spots: Could the Pacific open as a consequence of plate kinematics?". Earth and Planetary Science Letters. 265 (1–2): 195. Bibcode:2008E&PSL.265..195C. doi:10.1016/j.epsl.2007.10.013. "Towards A Better Understanding Of Hot Spot Volcanism". ScienceDaily. 4 February 2008. Wikimedia Commons has media related to Hotspot volcanoes.